Get old school with one of the original war games: Chess! 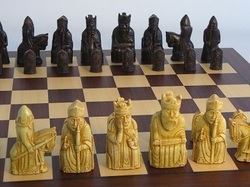 Do you have a cool chess set that you bought or built? Bring it in, show it off, use it in a tournament. You don't have to be a master player - this is more about fun and checking out some neat toys. When the tournaments over, we'll award prizes to the tournament winner, tounrament runner-up, and the owner of the most popular chess set!